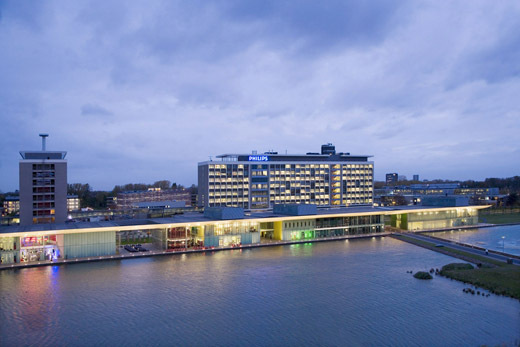 The iCareNet Winter School 2014 will be hosted by Philips Research at the High Tech Campus in Eindhoven during February 24 - 28, 2014. The High Tech Campus is known as the most innovative region in The Netherlands with more than 120 companies and institutes, hosting some 8000 researchers, developers and entrepreneurs all working on developing future technologies and products. Eindhoven has also been named the most inventive city in the world, with 22.6 patents for every 10,000 residents. All this provides the perfect setting for an exciting program on industrial R&D and innovation, grant writing, startups & ventures, and Big Data. This school event will focus on industrial research and development, innovation, grant writing and applications, startups and ventures, and Big Data. What is needed to setup a startup or a venture? Material will be added to the repository. We have organized a visit to the new Philips Museum. The museum provides a picture of the way Philips evolved from a small incandescent lamp manufacturer into a large and prestigious international group of companies. From the company’s origins in 1891 to the innovations of tomorrow. We will have dinner at Usine. Usine is a café restaurant in the center of Eindhoven, which was originally a Philips light bulb factory. The building has been redesigned yet maintains its old industrial look, resulting in a flawless integration of contemporary interior with the original characteristics of the once Philips factory. Participation in the Winter School is compulsory for all fellows. Research fellows must register by sending an email with the proof of payment to the iCareNet office. 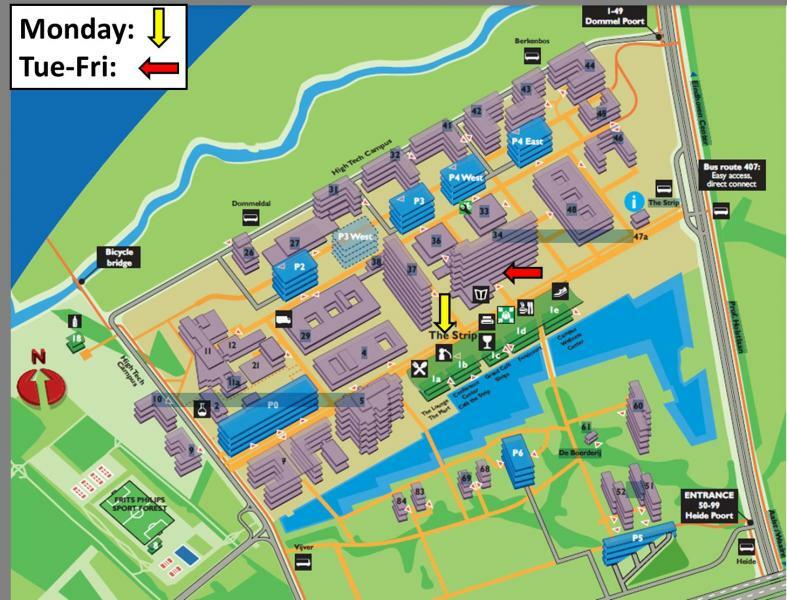 The first day of the workshop will take place in the PLANCK room on the first floor (see map). The program for the remaining days will take place in Building 34, basement, room K.026. Building 34 is located across the street from The Strip. To access the basement, we have arranged visitor badges that will be handed out on Monday. From the main entrance of building 34, the stairs to the basement are located on the right side. This will be marked by iCareNet signs. In case you are coming by car from outside Eindhoven, you can check the suggested routes here http://www.hightechcampus.com/contact-358/. You have to park in one of the parking garages and then walk to the strip. See the map – the parking garages are marked as P# on the map. Parking is free, we suggest to use P0, which is closest to the highway exit and has most free places. The bus station to use on your way back to the city center, is also marked. The workshop will take place at the High Tech Campus (HTC), which is about 6 km away from the city center (http://goo.gl/maps/U5O0Q). 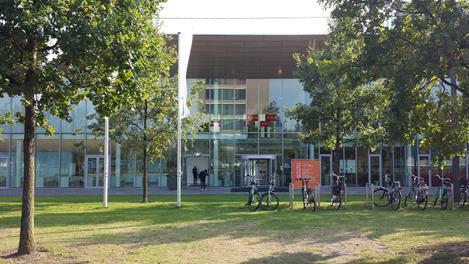 Please do not confuse it with the university campus of the Eindhoven University of Technology, which is close to the station. To reach it by public transport you can use the buses 407 and 17 which stop at the back (northern) side of Eindhoven Central Station. The bus tickets are 3.50 Euro in one direction. You should get out at the station HTC/The Strip. If you are arriving by cab it’s easiest to go to The Strip as well. In the case of traveling with a group it is not much more expensive to use a taxi – the taxi station is in front (south side) of the central station and the cost should be around 20 Euro. In case you want a real Dutch experience (and in case the weather plays along) you can rent a bike for 9.50 Euro per day at the VVV in front of the central station http://www.vvveindhoven.nl/en/tourist-shop/bike-rental. Electric bikes and scooters can be rented as well. It will take you 15-25 minutes to reach the HTC by bike from the city center. It is possible to fly directly into Eindhoven using select airlines such as Ryanair, Transavia, Wizz, etc. Buses 400 and 401 leave every 15 minutes in front of the airport entrance and reach Eindhoven Central Station (northern side of the station) after a 20 minute drive. Taxis are also an option and the journey should cost about 20 Euro. Amsterdam’s Schiphol Airport is the largest international airport in the Netherlands serving all airlines. From Schiphol to Eindhoven, there are trains that leave every 15 minutes, with the last train leaving at 23:17. A change of train may be required at Utrecht Centraal, depending on which train you take. The travel time to Eindhoven is approximately 01:30 and tickets cost 19,20EUR each way. You may also choose to travel to Eindhoven by train. You may use the Dutch railway website (http://www.ns.nl/en/travellers/home) to plan your trip. If you have any questions or need assistance, feel free to contact Joanna Gomez (joanna.gomezphilips.com), Enrique Gil (enrique.gilphilips.com), or Illapha Gyllensten (illapha.cuba.gyllenstenphilips.com). In case of emergency, you can call the Campus security at +31 4027 44444. Outside the campus, in case of emergency you can 112 for police, ambulance, etc. 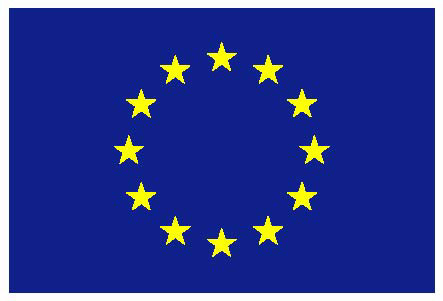 Language: The official language is Dutch although everyone speaks English. Electricity: 230 volts, 50Hz, standard two pin plugs. Water: Tap water is safe to drink.